This dish has leapt into my Top Ten of All Time Favourites. It is so easy-the kimchi does all the work by flavouring the rice. If you have made your own kimchi-or have bought the chilled sort -you may not need to add quite as much as the recipe suggests, as the jars are not as pokey. You could make this recipe even easier and quicker by using those ready-made sachets of cooked wholegrain basmati. Bring a saucepan of water to the boil and add the rice and a pinch or two of salt. Bring back to the boil then turn the heat down, cover with a lid and simmer for about 25 minutes until the rice is just tender. Drain well. You can cook the rice well in advance but be sure to cool it quickly and chill until you are ready to complete the dish. Blanch the asparagus in boiling water for 3-4 minutes, until just tender. Drain and refresh under cold water. Set aside. Heat the oil in a wok or large deep frying pan. 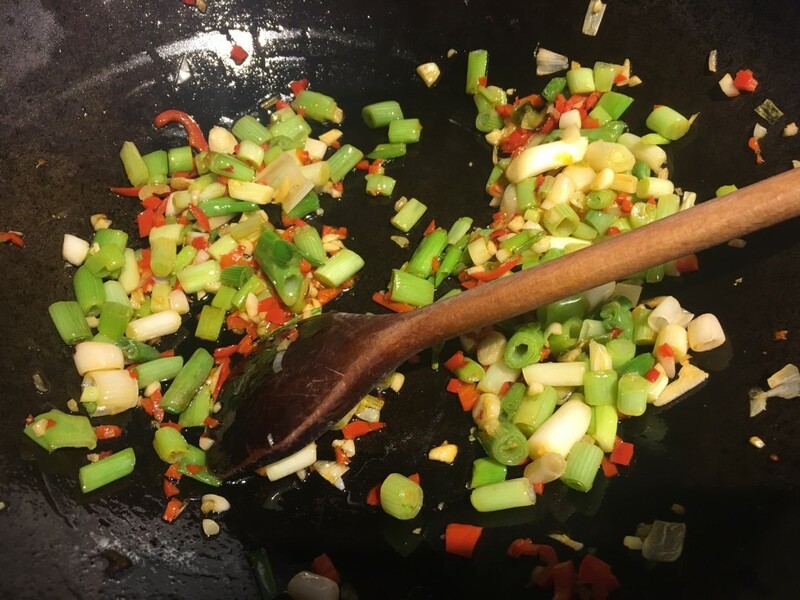 Add the spring onions, garlic and chilli and stir-fry for 2 minutes. 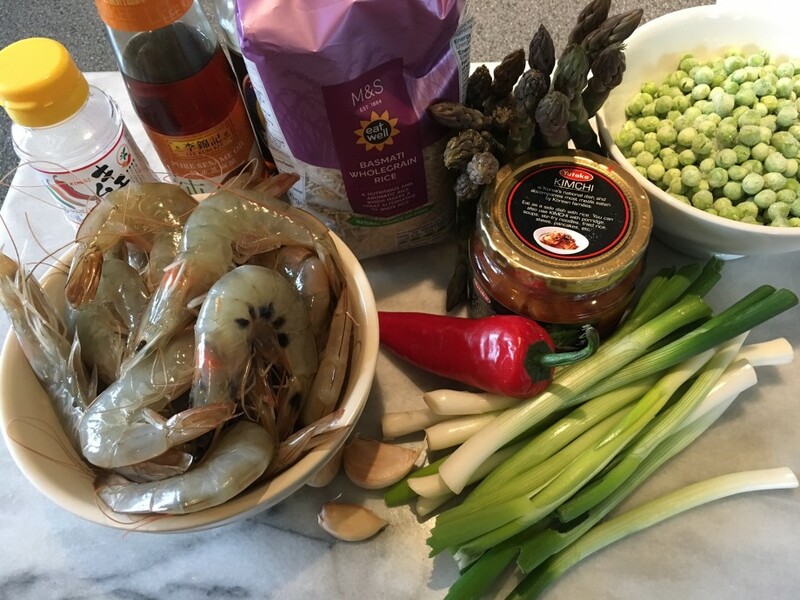 Throw in the prawns and stir-fry for 3-4 minutes until the prawns have turned pink all over. 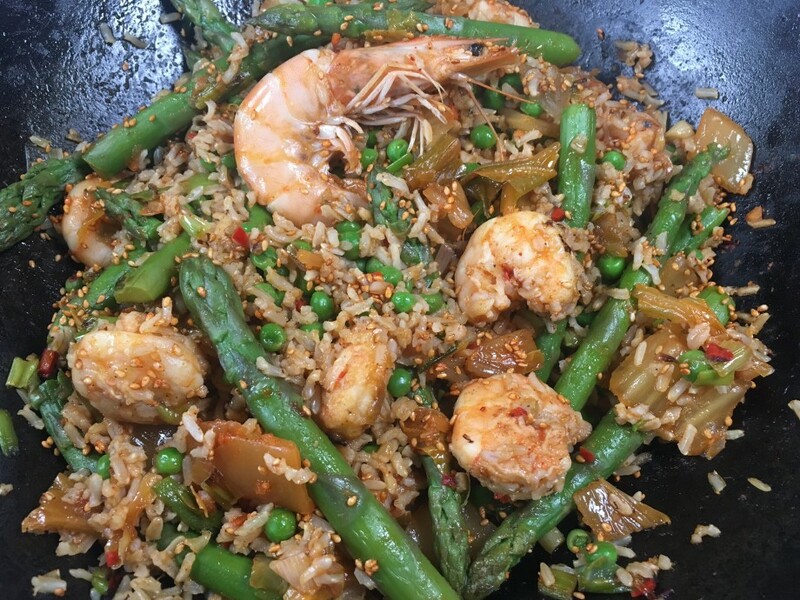 Stir in the cooked rice, asparagus, petits pois, soy sauce and kimchi and stir-fry for 3-4 minutes until piping hot. Sprinkle with the flavoured sesame seeds and serve immediately.